Cycling is incredibly eco-friendly. In fact, environmentalists advocate cycling as the ideal means of transportation, largely because bikes do not emit the carbon dioxide and air pollutants that other forms of transportation emit from their internal combustion engines. Also, biking is wonderful exercise for the human body, making it great for us and great for the planet. But did you know that cycling has helped save the environment by going one step further? Inventors all over the planet are starting to make bicycles from recycled materials, cutting out pollution and raw material usage in the manufacturing stage, yet again reducing the carbon footprint, and providing and even more earth-friendly means of cycling. The world’s very first recycled plastic bottle bicycle was created in Uruguay by Juan Muzzi, a man who has a very different perspective about recycling. He knows that with proper attention, we can take recycling to the next level of innovation and environmental protection. This is why he began his project by collecting plastic bottles from landfills, before conceptualising the bike’s design. At first, no one wanted to fund his project because they doubted that it was a good idea. However, Muzzi kept his dream alive and waited until he got funds, before creating Muzzi Cycles. He transformed 15,840,600 PET bottles into 132,000 bike frames, saving 980,732kg of oil and 2,738,277kg of CO2 deposits. The bikes are made by injecting melted plastic bottles into the bicycle frame mold. 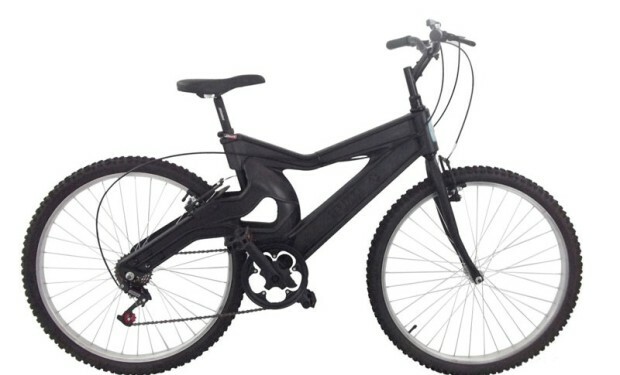 There is no soldering in the manufacturing process and it the bikes are surprisingly strong and fast. Muzzi sold the Muzzi bicycles at $140 per unit. This price only covers the production and he gets no profit is from it; he just breaks even so he can make more Muzzi Cycles. He keeps on experimenting with new prototypes to make the bikes lighter and cheaper to reach more cyclists; to let people experience the happiness of cycling for the benefit of the planet. With more recycling equipment in his area and within the local businesses, it’s plausible that Muzzi could make the bikes for even cheaper and even engage his local community in the process! The next innovative invention is the Frii Bicycle. It is also a bike made from recycled plastic and was designed by Israeli industrial design student, Dror Peleg. The bikes are also created by using recycling machinery to inject melted plastic into a mold. All parts are made from plastic and are strong and durable. Peleg thought up this bike as a school project. He considered using materials that could be found locally, rather than using imported materials. Also, he opted to create the bikes in the typical injection molding style rather than with high-tech 3D printing process. This is also because injection molding is widely used in his field and was much more cost effective. The difference between Muzzi Cycles and Frii Bikes is that Frii bikes are colorful and more fashionable. 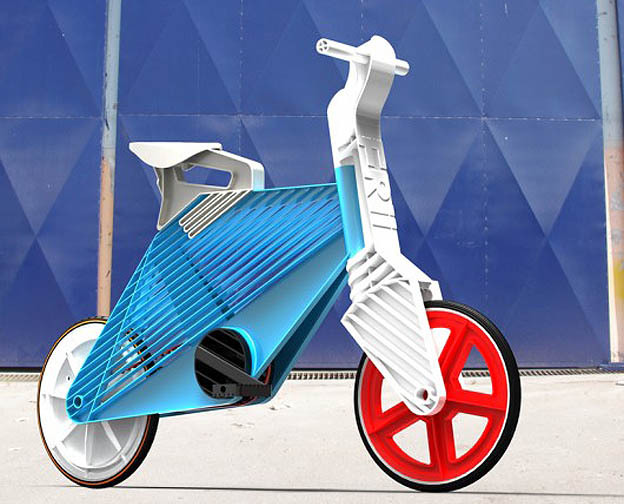 The design is futuristic, having pyramid-like plastic ribs as the main frame of the bike. The handles are short for additional strength and the wheels are small; because Frii bikes are intended for street biking, rather than road biking. There are no external brakes, because the design is adapted from VMX bikes. Frii is one of the bikes of the future, and at first look they may appear to be uncomfortable, but you can actually request a customised model to fit on your body type and height. These two recycled plastic bikes are just some of the proof that people are doing their part – no matter the size of the contribution – to help the planet, and these ideas actually have wheels. We humans keep on finding these innovative niches that allow us to make something useful out of someone else’s waste. Even better, these bikes don’t rust, so if you take care of them, they will last many years, and even if they do break, guess what? They can be melted again and turned into something new! We have to change our perspective on waste and continue to look for new avenues that will allow us to optimize our waste potential. These two bikes are proof that there are lots of possibilities if we just change our point of view. Let’s stop treating plastic as a disposable material and instead, let us always look at it as a reusable and recyclable material. This is because, the fact is, plastics are never disposable, they are a waste that will be here with us forever. Here at Kompakt, we are encouraging businesses to rethink their waste strategies and include recycling machinery into their process, so that they can turn waste into an income and resource. If you’d like to learn how your business can re-think its approach to plastic, call one of our dedicated advisers today on 01256 610102.